The British South Africa Company obtained the mineral rights from the Paramount Chief of the Lozi for the area in 1881. This land later became known as North-Western Rhodesia. The British suppressed an uprising led by the son of King Mpezeni, who ruled the vast territories, that came to be known as North-Eastern Rhodesia. Both lands were administered by British separately till 1911, when they were united and called Northern Rhodesia. After the end of World War II the process of decolonization started in Africa and the United Kingdom decided to form the Federation of Rhodesia and Nyasaland, consisting of Northern Rhodesia, Southern Rhodesia (now Zimbabwe) and Nyasaland (now Malawi), and give it a semi-autonomous status. People of Northern Rhodesia opposed this decision and started general strikes in 1960-61. In October and December 1962 Northern Rhodesia held elections for legislative council. It passed the resolutions calling for secession of the country from the federation and demanding full internal self-government under a new constitution. The federation was dissolved in 1964. Northern Rhodesia elected its first President Kenneth Kaunda, who took the office on October 24, 1964 and renamed the country the Republic of Zambia. 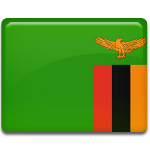 This anniversary is celebrated in Zambia as Independence Day, which is one of the public holidays in the republic.